Hi, it’s me, your 2011 model. Remember when you sold me to this apparently sane quilter, who claimed she wanted me to make lap quilts? You know, normal quilts? Well, all was fine for the first couple of years…then all of a sudden “art” quilts showed up. One after the other. With some of the most bizarre materials you can imagine…definitely not covered in my training back in the factory. Paint…ink…plastic…sigh. My colleague the Bernina is no help whatsoever…she just sits there with that smug smile. Take yesterday…I’m trying to stitch (another?!) 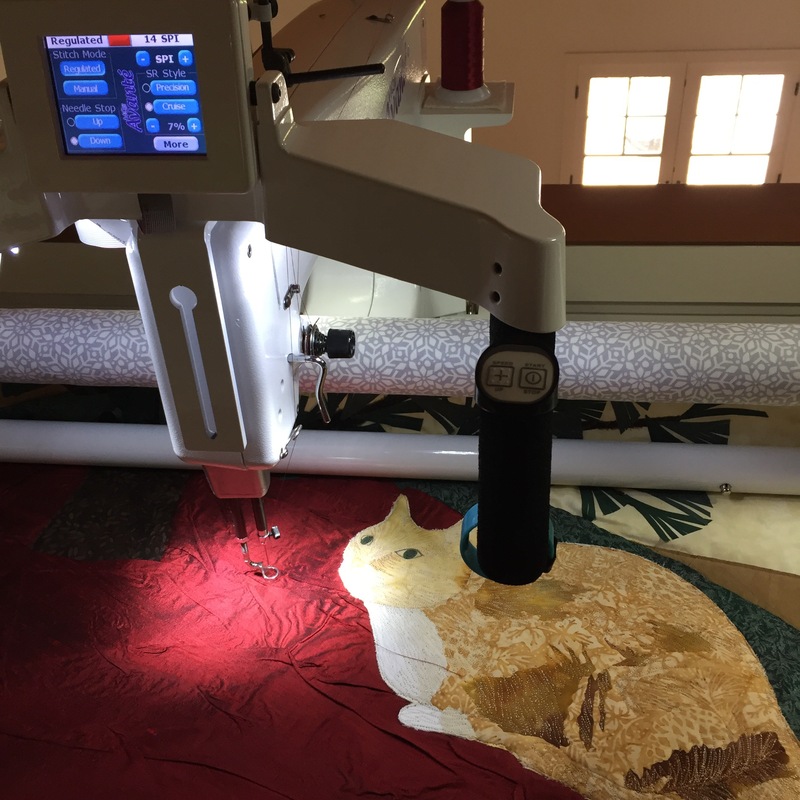 already layered/quilted/stitched cat onto LOTS of layers of fused silk. With monofilament both top and bottom. Do I get any thanks? No, all I receive (when the thread breaks) is less-than-polite remarks that the Bernina wouldn’t have a problem. I have kept myself in excellent shape (ok, I’ll admit, she is very diligent about maintenance) and would make an excellent partner for a traditional quilter. You know, normal stuff. Thank you in advance for your consideration. This entry was posted in Uncategorized on April 30, 2017 by neonkittyquilts.